Digital multimeters are essential devices for most electricians. They are needed by anyone installing, troubleshooting or repairing electrical equipment. Choosing the wrong device can result in botched work at the least and life-threatening electrical mistakes at the worst. There is a wide range of these types available for purchase, and finding the best multimeter can sometimes be a challenging task. The right unit will depend on how you use it, how often you use it and how much you want to spend to purchase it. You don’t want to end up with a unit that isn’t capable to handle your tasks, but you also want to avoid spending too much on one with extra features you don’t need. 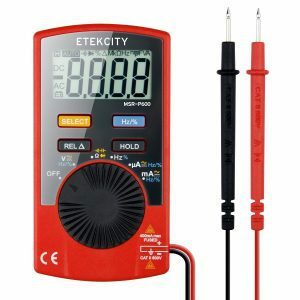 Here you can find multimeter reviews that provide essential information to help you narrow down your choices and find the right device. Are you familiar with the saying “where the power dies the problem lies”? If so, chances are you have used a multimeter in your life. If you do any type of electrical work they will certainly be your best friend. Not only because they help you diagnose electrical problems but they also help keep you safe. That is why owning the best multimeter is so important. A multimeter is an electronic measuring device that takes multiple types of measurement in one device. It prevents the need for having separate meters as it combines the functions of the best voltmeter, ohmmeter, and ammeter together. A standard multimeter has the ability to measure voltage, current, and resistance all in one device. Digital multimeters display the measured value with numerals, and some may provide a bar of length to represent the value measured. These types are much more common, but some may prefer analog devices in situations where the measured value changes rapidly. Multimeters are used to troubleshoot electrical problems in a variety of industrial and residential applications. When you think about it you realize it’s amazing all you can tell about an electric device or electric wiring just by using a multimeter. We consider these devices an essential part of any do-it-yourself or professional toolkit. 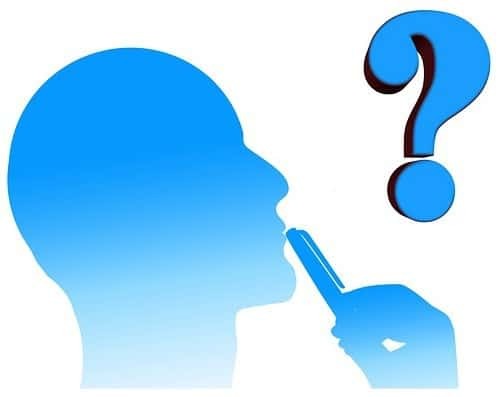 At one time or another when doing some type of repair on something that uses electricity you are going to need to test an aspect of the electric flow. 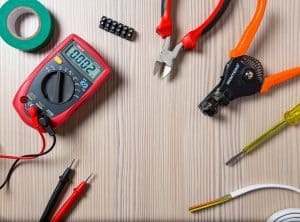 That is the very reason why we will take the time to review several of the top multimeter products in this article and give you a little more helpful information about these handy electric measuring devices. Here is a really nice multimeter with a clamp from Eventek. Clamp meters are nice because they make it very easy to take an amp draw measurement. This will help you see if an electrical item is working properly. It’s by far one of the highest user rated multimeters are on top 12 review list. There are other nice features on it too. It’s an auto-ranging multimeter so you do not have to fuss over different settings within test modes. The backlit digital display on it has easy to read large letters and these can be held until you record the measurement you have taken. It even has a nice non-contact live wire detection alarm. This multimeter is built using very good quality ABS plastic. There is also a 1-year warranty from Eventek that backs this product up too. It features protective rubber sleeves on each corner to help keep it from being damaged if dropped and included in the package is a soft carrying case too. 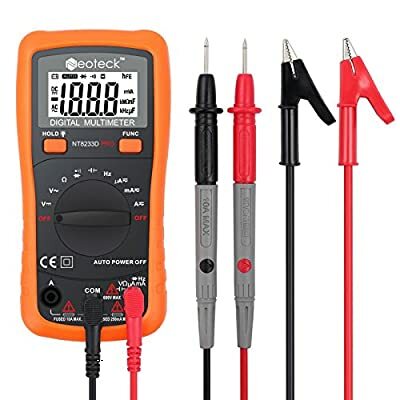 Here is a very good multimeter product from Tacklife. It’s one of the best budget multimeter choices considering that it’s an auto-ranging type multimeter. 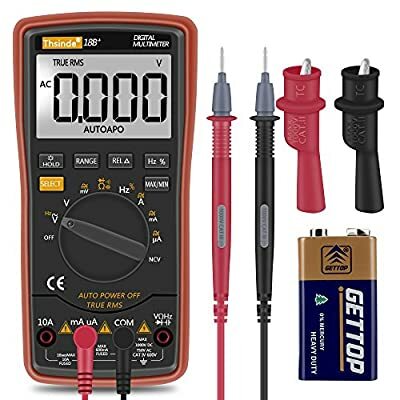 This is the affordable type of multimeter that every hobbyist, do-it-yourself repair person and casual electronic troubleshooter should own. It has many outstanding features on it that make it very simple to operate. This is also a very accurate multimeter. It features such things as an easy to read digital display that is nicely backlit for convenient low-light use. Not only can this multimeter double as a non-contact voltage (NCV) tester but it will also help you with data taking. This is due to the fact that it has max reading and data hold settings. This multimeter can be used for long periods of time without becoming a burden to hold thanks to its light 12-ounce weight. The 9V battery it needs to operate is already included in the package. It also has a 15-minute auto-off feature which will help significantly extend its battery life too. This multimeter is also warrantied for a period of 2-years which is double the industry standard. Etekcity is a company that is known for making precision electrical diagnostic equipment. The MSR-R00 multimeter does nothing to hurt that reputation. This versatile electric multimeter does such things as measure current, voltage, resistance, and continuity. You can even do transistor and diode testing with it. 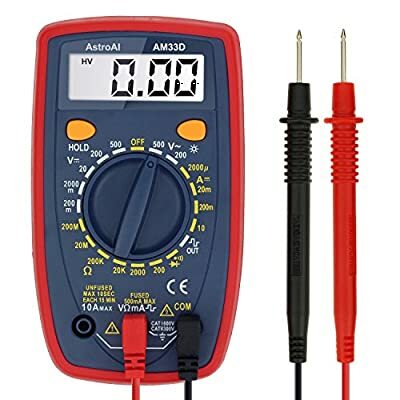 This is a great multimeter for those that are new to electrical testing. It’s also among the best budget multimeters you can buy. That means even hobbyists and do-it-yourselfers can afford to keep a good multimeter right in their toolbox. The design of this meter itself is good too. It is made of a rugged plastic material with an easy to see LCD digital readout. The readout is nicely backlit too for nighttime or dim light condition viewing. This meter is also shrouded in a protective sleeve so you have some forgiveness when you drop it or bang it on something. It comes backed up by a 1-year warranty and the 9V battery it requires is included in the package. Here is a nice multimeter from AstroAI that works great and is very budget-friendly too. This meter performs such tests as measuring voltage, DC current, resistance, and continuity. It will help you do diode testing also. Please note it will not measure AC current. This is a meter that is very easy to work too. Its convenient selector dial is clearly marked and it also has an easy to read large digital display. The display is also nicely backlit for low light use. Other convenient features include a built-in stand and a data hold button for recording measurements. The AstroAI multimeter here is also fully protected against overloads and incorporates fuses into this process too. It’s is made out of tough rigid plastic and backed up by a full 1-year warranty. Innova has designed a very nice little multimeter with this model. It is great for hobbyists, do-it-yourself work and light professional home or auto use. It has an easy to read oversize display and is super-lightweight at 11.2 ounces. Its ultra-convenient auto ranging means you never have to fine tune the test selection dial as you are measuring with this multimeter. That will save a lot of time as you are using it. It also helps you to keep a free hand as you are working too. One of the nicer features you get with this multimeter is its on-body probe storage. That helps prevent damage to the probes when not in use and makes this test meter very easy to store. It’s made of scratch and dent resistant plastic and the corners have rubber guards on them for extra protection as you use it. This multimeter product comes with a full 1-year warranty from the manufacturer too. 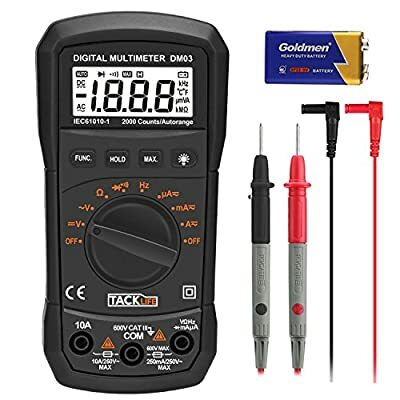 If you need a handy multimeter that is affordable and works great this may be the perfect fit for you. It does such important electric diagnostic measurements as voltage current, resistance, frequency, capacitance, continuity and diode testing.  That will help you troubleshoot many home and auto electrical problems. This Neoteck product has a wide variety of nice measuring features. It is auto-ranging so you do not have to constantly hand switch between ranges on the testing mode you are using. In addition, it has a handy auto-off switch after its display sits idle for a period of time. This really helps extend its battery life quite a bit. There is a built-in stand which will enable this product to sit at an easy 45° angle while using it too. It even has overload protection that uses double fusing to promote safety when measuring electrical currents. The high visibility orange softened plastic body it’s encased in will help protect it somewhat if accidentally dropped too. Here is a really well-designed multimeter from Crenova. It is a great tool for doing home and auto electrical diagnosis. This multimeter will accurately measure voltage, current, frequency, resistance and also allow you to test diodes. The dial-up test select mode is very straightforward for easy selection too. It’s made of high visibility orange plastic so it’s very easy to locate when searching for it inside your toolkit. The LCD display on it features large sized and easy to read numbers. This LCD display is also backlit for convenient low light use. This Crenova product is also an auto-ranging type multimeter. 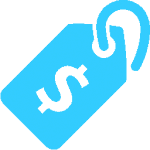 That eliminates the hassle of fine tuning test ranges in a mode while using it. There is a battery saving auto-shutoff feature too that will activate after 15 minutes of non-use. It’s easy to record the readings you take with this multimeter thanks to its data hold button. This uses a 9V battery to power it which is nicely included right in the package. 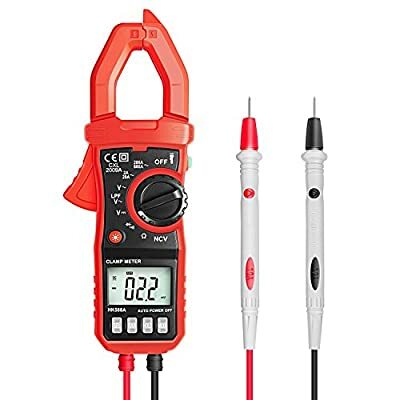 This is another well-rounded multimeter product that has a clamp for reading amp draw. That gives it a leg up on non-clamped multimeters as far as ease of use goes. It can do a very wide variety of electrical testing to help you troubleshoot wires and devices. It’s a sturdy plastic unit that has a large and easy to read LCD display. The test mode selection dial on it is very easy to set also. It’s an auto-ranging test meter and that makes it even simpler to use too. This multimeter will even hold the max number or other test reading until after you have recorded it too. There is even a built-in auto shutoff feature that kicks in after 15-min of non-use. The auto shutoff feature also helps its included AAA batteries last up to 150 hours of use. This product comes with a protective carrying case and is backed up with a warranty from Etekcity for a full 1-year. With this electrical test kit, you not only get a good working multimeter but you will get two bonus electrical testing items too. This includes a handy outlet tester that will verify that you wired in correctly or that it’s working properly. There is also a hot wire finder included in this package too which is great for quick wiring safety checks. Klein Tools is a company that is known for making test tools that are reliable, accurate and hold up well over time. That should give you some peace of mind when buying their products. This looks to be a solidly built unit whose sensitive electronics are shrouded in a heavy ABS plastic frame. It is a heavy duty Cat III double insulated meter which makes it safe in most instances for high voltage testing. There is a built-in data hold button and this multimeter features a very audible continuity indicator signal also. The test probes store right inside the meter body. The large LCD display is very easy to read even from a distance. Here is a good multimeter that measures such things as AC/DC voltage, DC current, frequency, resistance, continuity and diode testing. It is made by Thsinde and they obviously sought some professional experience when they designed it. The large variety of electrical tests it can do are easy thanks to the way it’s designed. It is auto-ranging so you do not have to mess with different settings within test modes. It can hold the data it tests for and tells you what the high and low readings are when testing too. It also uses an audible beep to indicate continuity. This multimeter can also be used non-contact voltage (NCV) tester. It even comes with alligator clamp test probes which is very unusual on most multimeters. The large LCD display on it is nicely backlit. It’s fully short-circuit and overload protected too. Janisa has a solid multimeter entry on our top-12 list of the best multimeter reviews. It features very accurate readouts that deliver true RMS results. It even doubles as an electrical safety device thanks to its ability to be used as an NCV (non-contact voltage) indicator. This multimeter can be used as a non-contact voltage (NCV) indicator too. Not to mention that it can also take the temperature of an object too. That comes in very handy when making some types of electrical diagnosis because heat is a byproduct of electric flow when it meets resistance. It is a very safe multimeter to use also. There is both built-in and fused short circuit and overload protection. Janisa back this product up with an industry standard one-year warranty too. Here is another multimeter that comes very highly rated by those that have purchased and used it. We agree 100% that this is a very well-built and well-designed electrical troubleshooting meter. 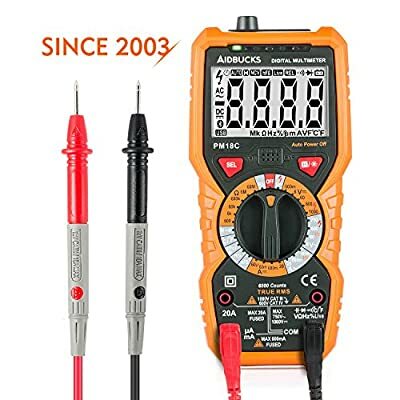 Fluke is one of the original multimeter design companies and that longevity always makes them one of the best multimeter buys. This multimeter is loaded with nice features. It has features that make it very easy to work such as its auto-ranging capability and backlit LCD display. It even has a digit hold feature, max reading feature and minimum figure reading capabilities. It even includes a rugged and soft protective carrying case. The case opens laterally which allows you to use this multimeter without taking it out of its protective storage case. This Fluke electrical measuring device is CAT III 600 V safety rated. That means it is safe to use even for most high voltage current measuring situations. Fluke is undeniably one of the top multimeter brands and one of the most recognizable. The brand is highly sought after in the multimeter industry, and they are a leader in the field. The company was founded in 1948 and has eventually grown to take over multiple markets, and the industrial and electronic service unit includes their diverse line of multimeters. The Fluke name is top when technicians consider troubleshooting and detecting complex electrical issues, and Fluke multimeter reviews show uniform satisfaction among customers in various industries. Compared to most other manufacturers, they have many brands that are all highly popular among multimeter consumers. The Fluke 115 is a compact True-RMS model typically used by professionals. It is more expensive than many other devices, but it offers a multitude of features on top of being highly reliable. Regarded by many as the best Fluke multimeter, the Fluke 87-V is a very popular model with incredible accuracy and numerous functions. It allows both manual and auto ranging, and it can take measurements at 20A for up to 30 seconds. Extech is another good multimeter brand that is trusted for producing top quality tools. The company was established in 1970, and it is a global brand with over a dozen types of products ranging from testing instruments to thermal imaging devices. The most popular model from the brand is their MN35 model, and it is one of the best inexpensive multimeters. At just above $20, this model offers incredible value for those shopping within a budget. It lacks some of the features of more advanced units, but it still does the job for those needing only standard features. The Extech EX330 model is a more advanced unit with auto-ranging that can be changed to manual. It can measure up to 10A and 1000V, and it measures resistance, capacitance, continuity, diodes, temperature, duty cycle, and frequency. Its non-contact voltage detection allows the unit to detect voltage by simply placing the device near the source without actually contacting or measuring it. 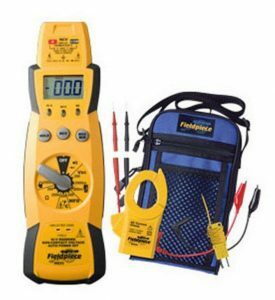 Multimeters created by Fieldpiece are designed for HVAC technicians, and these tools are made with almost 20 years of development put into them. Each product has features built into it that are significant only to HVAC professionals in order to provide components that are truly needed. Their handheld tools made strictly for the HVAC industry are unique to this trade as technicians must measure more parameters than professionals in many other industries requiring such instruments. Fieldpiece offers some of the most versatile, affordable and useful multimeters for HVAC applications. Fieldpiece designs their tools and accessories in the US, and many of them are manufactured in the US as well. The LT17A model measures temperatures up to 1400°F, has a capacitance up to 200MFD and a backlight suitable for light or dark environments. The HS33 model is the first attempt at the stick meter design, and it has a number of features made to make use much safer. Klein has been making instruments since 1857, and their tools are made in the United States. They have a long history of producing quality tools, and many are very affordable. Their MM200 model is a low-cost multimeter that has automatic ranging, handles voltage up to 600V and has a backlit display. 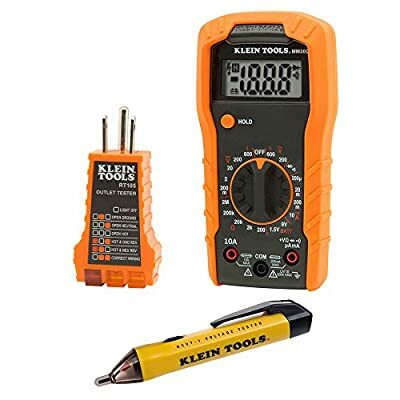 It may be one of the best budget multimeters, but the Klein MM1000 unit provides even the most significant functions for the standard electrician. The auto-ranging device has many of the same features typically found on much more expensive and advanced models, but it is available for a much lower price. It measures voltage, current, capacitance, resistance, and temperature, and it has a continuity check and diode tester. The MM1000 is simple to operate, and it’s very easy for beginners to master. Convenient features include an automatic shut-off to save the unit’s battery life and data hold to allow for safe and easy reading of information. Mastech was founded in 1987 and is one of the world’s largest manufacturers of electrical tools and instruments. The innovative company produces up to 3.5 million instruments every year. Its products are manufactured in efficient and high-quality facilities, and they produce over 200 types of products involving electrical testing equipment. Mastech products are generally very affordable, and the MS8268 model is possibly the best multimeter for the money. It is loaded with features despite its low cost, and it even has impressive features such as sound and light warning for jacks and a backlit LCD screen. It also has auto and manual ranging with relative measurement along with auto power-off. The MS8209 model has 14 different functions with 39 ranges. It includes 4 major environmental testing measurement functions and auto and manual ranging. It includes features such as data hold, auto power-off, and overload protection. Simpson Electric Company has been a leading brand in the industry of test instruments since 1927. They are known for their analog meters, and the Simpson 260 Series is one of the most popular analog multimeters available. Some users have a preference for these models due to their display, fast-moving trends and peaking adjustments. They can be used where the precise values to multiple decimal places are not needed like those provided on digital meters. Analog multimeters also have low impedance compared to the high impedance of digital models which helps when checking for ghost voltages. The 260-8 is an affordable and high-quality model with standard and high energy fusing along with diode network meter movement protection. The 260-8P has a relay overload protection circuit that is resettable and provides audible continuity checking. The 270-5RT provides even higher accuracy for voltage and resistance than its predecessors. Agilent multimeters have the drawback of often being much more expensive than other brands. The 34461A model is one of the most impressive from the brand, and one of its main benefits is its PC software. This component is free, and it allows data to be captured from the tool’s display with just screenshots. This allows for easier data recording along with the ability to create high-quality measurements that can be presented or displayed later. When another meter from Agilent is added, the software can synchronize both signals in order to plot multiple measurements. The 34461A has inputs in the front and back, and they can be switched at the touch of a button. It has easy controls, great accuracy, data logging and convenient PC connectivity. The 34401A model has a 6.5 digit resolution to offer more details compared to other digital multimeters, and True RMS for AC and currents. Innova is one of the youngest brands in the business, and they have facilities in both the US and Canada. The brand specializes in troubleshooting instruments for the auto industry, and they have a database of over 3 million issues. There are a few low-cost models available from Innova such as the 3320 auto-ranging model. Its auto-ranging scales eliminate the need to dial in ranges when taking electronic measurements. Its 10 megohm input is safe for a variety of purposes including wiring, household outlets, fuses, vehicle batteries, automotive circuits and more. It is useful for hobbyists or others that may not need all of the features of more advanced models. The 3340 is made to suit the needs of professionals as well as home mechanics. It features a temperature probe and inductive RPM clamp to allow for thoroughly checking the engine’s wiring. It also has overload protection, automatic shut-off, automatic zero adjustment and reverse polarity protection. Amprobe is an American company initially established in 1948. The brand was responsible for creating the first clamp meter, and they have been a leader in innovation since then. They produce a wide range of instruments for both commercial and residential use. Amprobe has a reputation for making safe and reliable tools and instruments. As one of the best multimeters under $100, the best-selling multimeter from this brand is the AM-520 HVAC. It has a high rating of 4.5 stars from 200 reviewers, and it is available for the affordable price of just $60. It is made to allow HVAC professionals to measure temperature, capacitance for checking startup and microamps for flame sensors. It has non-contact voltage detection and audible continuity. The Amprobe AM-530 model has True RMS that allows for accurately measuring voltage and current under various conditions. In addition to its powerful battery, the unit features a backlit LCD display, audible continuity, non-contact voltage detection, data hold, relative zero mode, and a built-in flashlight. 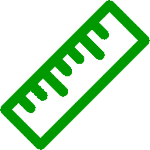 Greenlee is a brand with over 140 years of experience in the industrial field. Starting in the wood industry, the brand went on to make a presence of over 70 years in the electrical industry. The company produces a small range of multimeters, but they present significant quality. The ISO 9001-accredited brand is a reliable one. Units from this company will usually cost between $125 and $300. Most of their range can tackle up to 1000 V and between 200 and 830A. Models from Greenlee usually sell less compared to big names such as a Mastech multimeter or Fluke voltmeter, but they should not be overlooked. The DM-210A is made to combine all of the most important features into a small and ergonomic design, and it can handle CAT IV 300V, CAT III 600V and CAT II 1000V applications. The DM-45 can measure data such as frequency, temperature, capacitance and duty cycle along with battery testing and an analog bar graph. Sinometer tools provide features, reliability and quality users need, and they also have models available to fit into your budget. Multimeters from Sinometer are designed to put accuracy and dependability above all other characteristics, and they do not cut corners when it comes to quality and features. This is helpful for those looking for a unit at an affordable price that don’t want to settle for models of poorer quality. The MAS838H model is a pocket-sized unit that is ideal for DIY users and hobbyists. It features an LCD display that goes to 3.5 digits, temperature measurement and audible continuity. It also has data hold for easy reading and retrieval of information. The Sinometer VC97 is a unit with many features, and it acts as a thermometer. The auto-ranging device provides readings up to 3999 to provide more accuracy than those reading at 1999. The DT61A is a highly precise model with a backlit display, auto power-off and data hold. The voltage refers to the electrical potential of the device (the electric pressure in a circuit), and it is measured in volts (V). The voltage is measured with the voltmeter function, so the multimeter must first be switched to the volt setting (denoted with “V”). Locate the test leads, and connect them to the meter. The red lead should be connected to the red input terminal (labeled “VΩ”), and the black lead should be connected to the common terminal (labeled “COM”). The red lead is attached to the terminal with higher potential with the black lead to the one with lower potential. 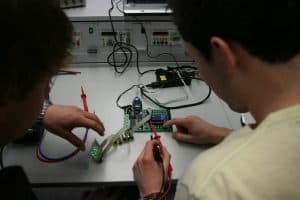 Once the leads have been connected correctly, you can measure the voltage with the multimeter as accurately as the best voltage meter. 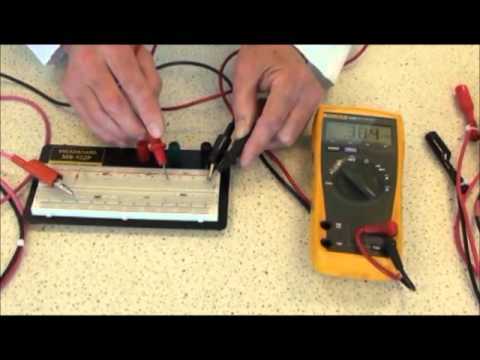 Measuring current is measuring the flow of change in electricity in a circuit, and it is provided in amps. Measuring current is slightly more complicated than measuring voltage because you have to do so in a series. You must place the meter between the flow of current, and this requires interrupting the power connection. To begin, set the multimeter to the ammeter function (labeled “A”). Connect the red lead to the terminal labeled “300mA” and the black to the common terminal (“COM”). After properly connecting the leads, attach the device to the circuit that must be broken. Attach the meter in series between the open points to get amp readings. 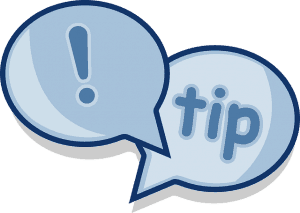 After measuring current, you must always switch the unit off or back to the volt setting before taking a different electrical measurement. Failing to do so may ground through the meter which may blow the fuse. Resistance refers to the level at which an electric current is opposed through an electrical conductor. It is measured in ohms denoted as “Ω.” To begin, disconnect the power and wiring of the circuit that is to be measured in order to prevent exposure to potential hazards. Turn the meter to the ohms (Ω) setting, connect the red lead to the “VΩ” terminal and connect the black lead to the common (COM) terminal. The display should show “OL” to denote overload. To measure the resistance of the circuit, connect both the red and black leads to the circuit. You will then be able to acquire the ohms reading. Should You Get An Auto-Ranging Multimeter? As you have looked at the reviews on the different model multimeters on our top review list you might have noticed a pro feature on many of them called auto-ranging. You may have noticed that not all the multimeters on our best review list had this feature too. So how important is it that you have an auto-ranging multimeter? 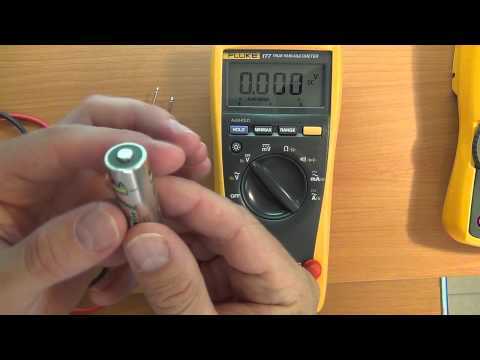 The answer lies in how much the ease of which your multimeter works means to you. Most of your non-auto ranging multimeters have the same electrical test modes that auto-ranging multimeters do. They also have different ranges within these test modes. That means you will often have to change the range as you are taking your measurements. This can be quite tedious and time-consuming if you are doing electric diagnostic testing on a regular basis. That is where auto-ranging comes into play. It makes taking electric measurements with a multimeter much simpler. Auto-ranging does this by eliminating the need to constantly switch between different ranges within a specific testing mode (such as when testing resistance = Ω). When a multimeter is an auto-ranging model all you have to do is set it to a specific test mode. The meter itself is designed to automatically go to the proper test range of that mode where it can take an accurate electrical measurement. 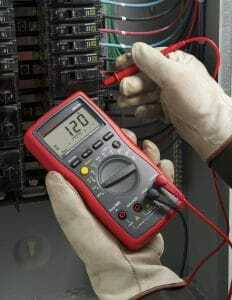 It saves much time and aggravation as you are taking electrical measurements with a multimeter. That makes electric troubleshooting and diagnosis much easier. Auto-ranging multimeters have one other significant benefit too. That is the selection switch choices appear much less cluttered on the face of the multimeter. Instead of seeing several different range choices under each testing mode you will just see the mode symbol itself. So auto-ranging not only makes taking electric diagnostic testing easier, it also makes your multimeter testing mode selection much easier to make. The bottom line is you absolutely do not need an auto-ranging multimeter to make most electrical diagnostic tests. With that being said, having an auto-ranging multimeter will make your electrical diagnostic test taking with a multimeter much less complicated and time-consuming. Is It Always Better To Own A Digital Clamp Multimeter? For certain types of electrical diagnostic testing a clamp style multimeter is an absolute must. That does not mean, however, that everyone needs to own a clamp style multimeter. What does a digital clamp style multimeter measure? It measures what is called amp draw. That is a fancy way of saying how much power certain parts of an electrical device are using at one time. This information can be very handy if you know what the operating amp range is supposed to be on a part of a certain electrical device. Let us give you an example. You may be a person that is tasked with replacing the heater element in a hot tub. Once that heater element is replaced you want to make sure it’s working properly. The best way to do this is to check its amp draw. You know that for this particular type of hot tub the amp draw for the heater portion of it is 22.5 amps when working properly. So when you turn on the hot tub you will then hook the clamp portion of your multimeter around the wire that feeds one leg of the heater element. If it reads that the hot tub is drawing near 22.5 amps you know you have successfully replaced the heater element in the hot tub and its working properly. 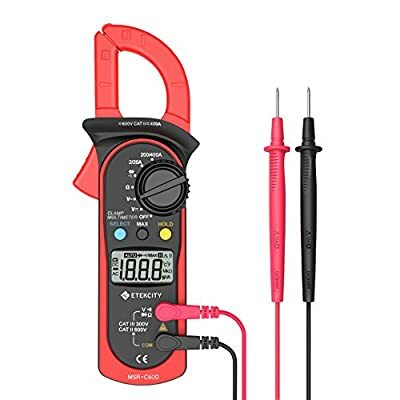 So basically it’s important to own a clamp style multimeter if you work on many electric powered devices that you know the proper amp ratings of its working parts. If you don’t need to do these types of electrical measuring then a clampless multimeter should work fine for all other types of electrical diagnostic testing. Why Pay Extra Money For the Best Multimeter Model That Has The Same Test Modes as a Budget Friendly One? There are some incredibly inexpensive multimeters on our top review list. To be honest, they do all the same measurements for the most part as some of the much more expensive multimeter models on the list. The question is then why would you ever want to spend more money on a higher priced multimeter? The answer to that is because of the way they help your electrical testing go smoother and be more accurate. Let’s make one thing clear first. More expensive multimeters are like more expensive cars. You usually get more conveniences with them and more useful options. We already mentioned such conveniences as a multimeter that is auto-ranging. You may also get more accuracy which can be important for some type of electrical diagnostic testing (true RMS measurements are among the most accurate forms of electrical testing measurements). 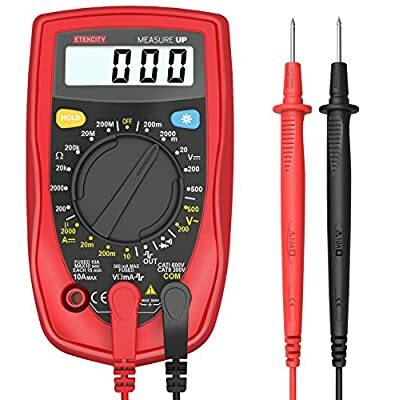 So if you are a model plane flying hobbyist that only occasionally does your own electric troubleshooting, then you can most likely get away buying a very inexpensive multimeter. On the other hand, if you install household surround sound systems you will need a very accurate means of electrical diagnostic testing and in turn, should use a higher end multimeter to accomplish that. Pocket multimeters are meant to have an added benefit of convenience compared to other types. These types are made to be easy to use and carry, and many can be used with just one hand or carried in the pocket. Pocket multimeters are built to be compact to make use easier, but even the smallest multimeter should come with most of the same functions and features available on larger models. Fluke is a highly respected brand in the electrical tool industry, and the Fluke 115 is considered by many to be one of the best handheld multimeters available. The Fluke 115 is somewhat unique compared to most models due to being compact enough to fit in the palm of the hand comfortably. The compact unit is an auto-ranging multimeter with a decent price that makes it suitable for professionals as well as hobbyists. The accurate and reliable unit has a durable build that places it high above many other devices in its class. It checks continuity, frequency, capacitance and diode testing. Its True RMS system offers better accuracy for non-linear loads, and it can measure 20A at 30 seconds and 10A continuously. Multimeters are used for electrical applications, so generally, the best models available can be considered the best for electronics. The reason it is important to specify which models are best for electronics is due to the fact that some multimeters are specifically helpful for other areas such as HVAC or automotive applications. The best electronics multimeter should measure voltage, resistance, and current at the least with other features such as auto-ranging, data storage, continuity and temperature for more advanced models. Many agree that the best digital multimeter for the money is the Fluke 87-V. The renowned 87-V model offers incredible accuracy, various functions and the ability to choose between manual or automatic ranging. This provides the user with better flexibility when working on different types of electrical concerns. The 87-V takes reliable measurements that can go as high as 20A for up to 30 seconds at a time. The unit is very simple and easy to use, and it has a clear screen that is large and backlit. On top of its capabilities, the meter is built to be durable enough to survive drops at 1 meter. Another benefit it its glove-friendly controls that come in handy when used during colder weather. An HVAC multimeter is one that is used specifically for HVAC professionals and applications. It may not have all of the features of a standard device, but it can also have more functions that will not be found on other units. Multimeters for HVAC use are created to make the work of HVAC technicians much easier. The best HVAC multimeter should save time and effort by eliminating the cumbersome presences of unnecessary controls while also including specific features needed to handle HVAC related tasks. There are many multimeters made primarily for HVAC purposes, and others are made for more general use while still being capable of handling HVAC issues. The Fluke 116 is a highly favored multimeter for HVAC use. It can take temperature and micro measurements along with capacitance, continuity, frequency, and resistance. It prevents false readings due to ghost voltage with its low input impedance. One of the benefits of the Fluke 116 is its compact and ergonomic design that allows for easy one-handed use. It also has a large white LED screen that is backlit and easy to read in various lighting conditions. The 116 does not include amperages, but this is not usually needed for HVAC use. An automotive digital multimeter is a diagnostic tool used to measure the electrical system of a car regarding voltage, resistance, and current. Mechanics use these tools to detect malfunctioning of the batteries, motor or engine in order to provide the proper service to correct the problem effectively. An auto multimeter is important for measuring resistance needed when handling switches, relays, and fuses, and it can help prevent the need to replace certain components of the electrical system. Checking continuity is important for repairing broken wire and testing fuses, and measuring the current can detect drain’s in the car’s battery. The UL certified INNOVA 3340 model is made to safely determine various automotive and household concerns. It features auto-ranging scales to eliminate the need to dial in the proper range, and it also has a large display. 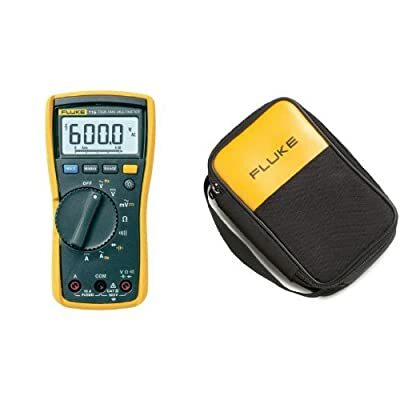 Fluke is one of the most dependable brands in auto multimeters, and their 88-V model measures signal pulse width. It can be used to determine the health of an injector, carry out diode tests, measure duty cycle and measure frequency. The MS8268 model from Mastech is extremely affordable, but it provides similar quality and many of the features of expensive Fluke styles. There are several brands to choose from when it comes to selecting the best digital multimeter. The most well-known brands are sought after for having built a reputation for producing quality tools that offer the best result. You should research different brands to become accustomed to the types of products they have available in addition to reading reviews of the best models. Quality multimeters should have a sturdy build that can withstand drops and bumps, and they should have an expected lifespan on the longer end of the range. Some models are known to last longer, and some brands are known to constantly produce models that can endure more than many others. 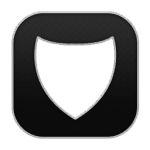 Good devices will often be dust or waterproof, and they will be able to withstand various temperatures. Units above $100 will usually present better durability with components that are easier to adjust. They will also be made with better materials. When considering the features of a multimeter, consider what the unit can measure and how well it does so. Standard units allow you to measure current, AC/DC voltage and resistance. Additional features usually include auto-ranging, data storage, adjustable sample rating and triggering. Auto-ranging makes the unit more flexible and allows you to choose a wide range of voltages. This feature is helpful for detecting malfunctioning wiring systems and computer issues, among other applications. It is important for the unit’s display to have big digits with great visibility and a backlight in order to be able to use the multimeter in a variety of light conditions. The peak hold allows you to keep the data visible while keeping your hands free without having to watch the display while engaging the device. Continuity is useful for determining if a wire or circuit has a break, and some units respond better by providing more audible alerts. HVAC technicians should look for multimeters that allow temperature measurement, and these units often include K type measurements or IR thermometers. The readings produced by your meter should be trustworthy in order to ensure the safest and most effective results. 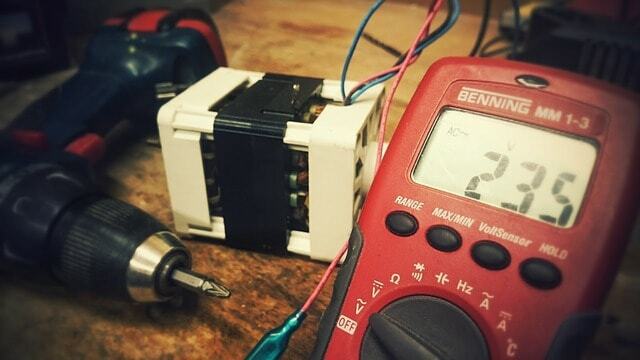 Calibration of a multimeter is important to ensure safely accurate readings. The accuracy of the unit is described as the maximum error limit considered acceptable for a reading. It is expressed as ± (% of reading + the number of the least significant digit). This shows the accuracy as the maximum limit around the true value of the measured signal. A multimeter with True RMS presents better precision, and it refers to the conversion of the AC signal data into the digital value given in the display. These units are more expensive to purchase, but they provide much better measurement. Meters with True RMS calculate accurately even upon encountering irregular waveforms such as square or sawtooth waves. Reliability is an important component of any electronic device. 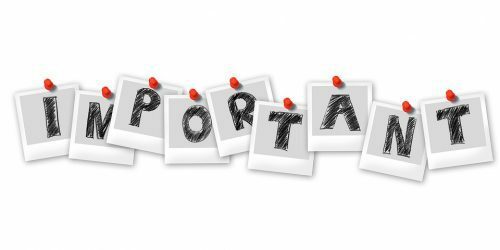 You need the unit to be available to work whenever it is in use. When calculating data, reliability also refers to the ability to receive the same results with repeated trials. This is essential for having an accurate device. You can compare models against one another to determine if one or both are relatively accurate or reliable when measuring current, voltage, resistance, and frequency. 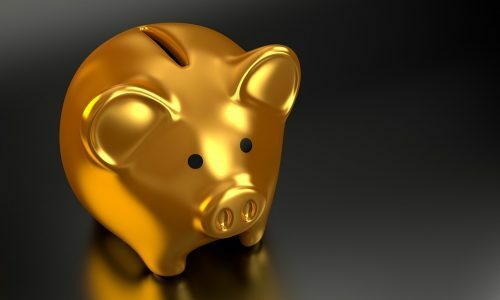 Different brands will have varying prices for their multimeter units, so it is best to research and look around in order to make selections within brands that have models in your budget range. The features you aim for in your unit will also affect how much you can expect to pay. The cost can range from a mere $50 all the way up to over $400. Purchasing a multimeter that is not calibrated will allow you to buy one at a reduced price, but you compromise the benefit of set accuracy. Additionally, you would have to pay to have the unit calibrated annually. For quality calibrated devices, you should expect to pay over $100 at the least. Most people search for handheld multimeters, and these are much more affordable compared to bench top models. Bench top models are much more expensive and usually cost up to $1,000. Having a safe multimeter means you can depend on it to provide accurate data and safely take measurements. When you choose a unit, you should determine the CAT levels in which you plan to operate. Your multimeter should have a voltage rating higher than the maximum voltage you will test at each CAT level. A higher voltage rating means a higher transient withstand rating within each CAT category. It is important to keep the category in mind when comparing voltage ratings in order to make sure you have the right tool for your tasks. One of the aspects of the best multimeters that is often overlooked is their ease of use. In addition to its capabilities and physical build, a unit should be simple to control without having to rely on supplementary information. Top notch brands will develop over time to create units with controls and displays that are as easy as possible to master. These units will be ready to use out of the box, and they will not require much time or effort to learn the controls. Good units will be capable of a variety of functions with controls that are easy to adjust. For electricians and other professionals, multimeters are essential tools. Professionals have to be certain about values regarding electrical components when installing or maintaining equipment, and the only way to do so is with a multimeter. It is absolutely necessary to have a product built with the best quality as working with electricity is dangerous, so the technician needs to have the most precise information at the right time to be safe and provide the best service. When shopping for the best multimeter, you must be able to find the right product for your circumstances. What is the best multimeter? A good multimeter must have the precision to offer you accurate values so that you don’t make mistakes that can ruin your task or compromise your safety. You also want to find a model that is built with good quality, and it should be able to withstand environmental impacts as well as performing well over time. If you don’t need all of the most complex functions, you should try to find a quality instrument that is still within your budget. It may be better to find an affordable model than to spend too much on a tool you may not know how to use or one with features you may not even need. When shopping for the right model, it helps to search multimeter reviews from other users, professionals or other experts. This allows you to view the pros and cons of each model, and you can use this information to compare models to one another. Once you’ve found the best of your selection, narrow down your choices even further to determine which models are the most compatible for you. These would be the tools that match your needs better than all other units. As a last step, take the chance to test meters out in person before purchase to get a real feel for how you may be able to use them. Making the Decision? The final choice in picking a quality multimeter lies in your hands. 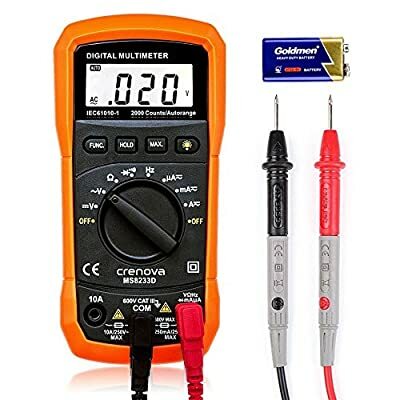 You should carefully look through digital multimeter reviews in order to become familiar with the features and functions they offer. With a list of the features you need already in mind, match models that interest you with what you need in a multimeter based on how you expect to use the device. 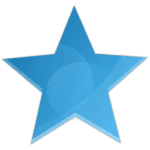 You must also use the information you find in reviews to compare various models against one another to determine which ones stand out above the others. This will help you find models that match your needs, but you will be able to find the high-quality models at the same time. If being able to use a dependable multimeter is a necessity in your line of business, get started selecting a model so you can put it in play as soon as possible. Where Can I Buy a Multimeter? Where you purchase your device may be just as important as the model you bring home. Many stores in your local area should have multimeters for sale, and this is helpful if you need a device as soon as possible. The drawback to shopping this way is the fact that you may not be able to find the best cheap multimeter or the exact model you planned to buy as your local stores may not carry it. This is one of the reasons why it is usually better to order a multimeter online. You will be able to find the device you want, and you can find a good cheap multimeter nearly anywhere. Buying on Amazon allows you to take advantage of discounts that you probably would not find elsewhere. You really can’t go wrong by purchasing any of the multimeters that we reviewed on this best multimeter list. They all will greatly enhance your ability to diagnose problems with electrical devices and with electrical wiring. With that being said, there are two multimeter models that we thought really stood out from the rest. As far as budget model multimeters go, we really liked the TACKLIFE DM03 Auto Ranging Digital Multimeter. This multimeter has some outstanding features for an incredibly low price. There is its nice backlit, easy to read display; its data hold ability and there is the fact that it also doubles as a nice non-contact voltage finder. It’s also amazing that you can buy a multimeter that is auto-ranging at the price you can get this one for. Which multimeter is our overall favorite on out top review list? It would have to be the Eventek ET820 Auto-ranging Clamp Style Multimeter. It can help you do just about any type of diagnostic electrical testing that you need to do. The great features start with its wire clamp that will help you measure the amp draw of products you are testing. It’s also auto-ranging, has a live wire detection alarm and is made using sturdy high-quality ABS plastic. You can never go wrong adding this multimeter to your diagnostic tool inventory. fluke.com : What is a digital multimeter?